Just when construction companies thought they knew everything necessary to transition to the new revenue recognition standards, Embark shows up to throw a wrench into the works. While we do it from a place of love and have certainly done our fair share to keep everyone up to speed -- even distributed a fantastic and concise guide for the new standards -- we couldn’t in good conscience leave our construction friends in the lurch. 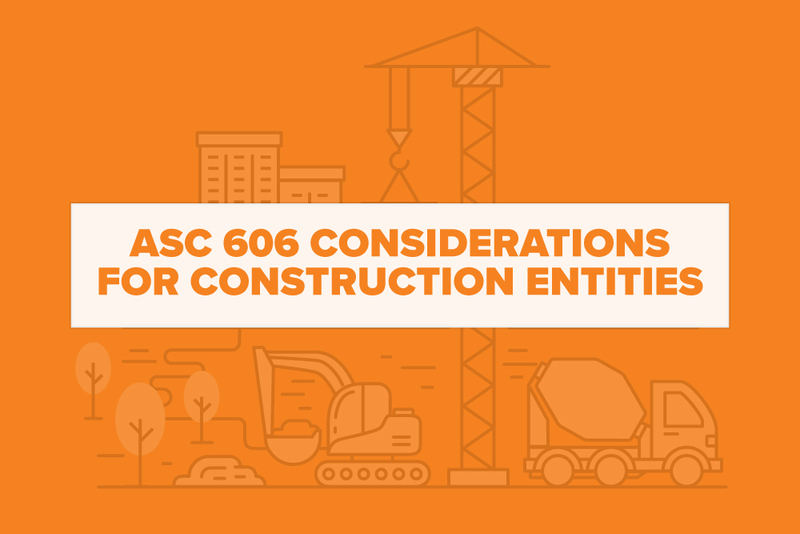 Therefore, we offer you, our construction entity compatriots, a few special considerations to take into account as you continue transitioning along the ASC 606 guidelines. Hopefully, you’re already well on your way towards full compliance and, with a bit more knowledge regarding the following industry-specific considerations, it’ll be smooth sailing and revenue recognition bliss from here on out. The vast majority of agreements for construction entities have language that specifically discusses a guarantee, better known as a warranty. Granted, warranties aren’t specific to construction entities but, given their prevalence in the industry, they warrant an extra dollop of attention. ASC 606 identifies two basic varieties of warranties: assurance types and service types. Assurance-type warranties: This type of warranty provides a promise to the customer that the delivered product will be as originally specified and remain in effect for a designated amount of time. According to FASB, these are not additional goods or services and, therefore, not considered separate performance obligations. Estimate your assured warranty costs according to the guidelines outlined in ASC 460, Guarantees. Service-type warranties: Less common to construction entities as they are increasingly offered via third parties, service warranties typically extend over a longer period of time and cover service issues unrelated to product defects. They are an additional service and, as such, the agreement may state that it can be purchased separately. Since these warranties are a separate performance obligation, a construction firm should allocate a portion of the transaction price to the warranty. Consistency breeds sound financials. Whenever possible, use the same cost measurement method for similar types of projects. Most construction companies use the cost incurred input method -- the actual costs incurred measured against the total estimated cost -- rather than the output method as detailed in the guidance, gravitating towards its ability to reflect the progress of its underlying performance obligation in its revenue. This, of course, means firms should frequently update their budgeted costs since projects tend to go over budget, past projected dates, and generally have a way of throwing companies a consistent stream of curveballs. Once again, this applies to all industries but is especially prevalent in construction. Some contractors have a contract asset, better known as a retainer, that is not due to the contractor until the project is complete or other performance-driven factors have been met. In specific terms, a contract asset is a company’s right to payment for goods or services already delivered but contingent upon something other than simply the passage of time. This would include a contractor fulfilling a contract obligation but still having to fulfill other obligations before being entitled to payment for their service. Alternatively, a contract liability is an obligation to transfer goods or services to a customer at the earliest of when the customer prepays consideration or the time the consideration is due. A contractor must treat a contract asset differently than a receivable since it doesn’t meet the definition of a receivable or, more specifically, an unconditional right to the payment. Previously, companies treated retainers as receivables but, under ASC 606, a receivable is different than a contract asset. For example, if a project includes a 5% retainer and a contractor’s firm submits a $100 invoice or application for payment, $95 is considered a receivable and $5 is a contract asset that’s contingent on other, performance-driven factors and distinct from the passage of time. Remember, you don’t have to necessarily call such items a contract asset but must distinguish it from receivables. In other words, they must be presented separately for reporting purposes and, along with contract liabilities, presented net per contract. Every construction company already knows that the only absolute is change. Plans are fluid and dynamic, as are the wants of the final customer. Therefore, change orders are a common occurrence in the industry that warrants another special consideration. Such change orders must be analyzed to determine if they are a contract modification according to the guidance and if so, would require a cumulative catch-up adjustment. This would be in lieu of an entirely new contract in of themselves since the performance obligations remain the same, just with an adjusted budget or scope. In construction, subcontractors are just a part of doing business. Therefore, every construction company will have to consider their role and responsibility to determine if they are the principal or agent for each distinct good or service provided to the customer. That determination will inform how a company will record revenue based on whether they’re a principal and, thus, records revenue for the performance obligation on a gross basis or as an agent and records revenue for the fee or commission it expects to be entitled to in exchange for arranging the performance obligation to be met. You have discretion in establishing the price for the good or service. If the company providing a good or service to the customer doesn’t have the ability to direct those products or services, they are likely an agent. So there you have it. Not so bad, right? At Embark, we understand the new revenue recognition standards have ruffled a few feathers and caused some sleepless nights. However, for those in the construction industry, these new insights should go a long way in clearing up the new guidance. Use our ASC 606 guide with these additional special considerations to make sure your books are compliant, spotless, and can withstand even the most scrutinizing eye. You’ve worked too hard, persevered too much up to this point to crawl across the finish line.